The District of Grevenmacher (Luxembourgish: Gréiwemaacher) was one of three districts of the Grand Duchy of Luxembourg. Its capital was the city of Grevenmacher. In 2015, the districts were abolished. It was the easternmost of the districts and the smallest of the three districts, with an area of 524.8 km2 (202.6 sq mi). It is the district with less people living in it with a population of 64,978 inhabitants and a population density of 56.2 inhabitants/km². When the districts were created on 24 February 1843, Grevenmacher was one of the three of the country. On 2012, the communes of Burmerange and Wellenstein were made part of the commune of Schengen. So the number of communes changed from 26 to 24. 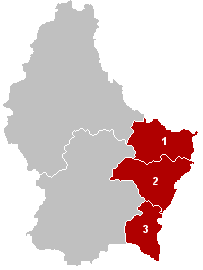 The district of Grevenmacher is bordered to the north by the German state of Rhineland-Palatinate, to the east by the German states of Rhineland-Palatinate and Saarland, to the south by France (the Moselle département) and to the west by the Luxembourg district. The Diekirch district has 3 cantons and 24 communes. Grevenmacher (district) Facts for Kids. Kiddle Encyclopedia.